Hands down, one of the hardest workers on the independent scene is Alex Varughese. Based out of Edmonton, he's a veteran of the rock and metal brigades with Sugakane, Vela and Kingdoom, blues gurus Jimmy & The Sleepers, and has recorded and toured with Econoline Crush, among others. 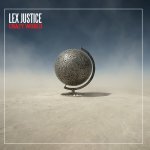 His new project is his rastafarian alter-ego Lex Justice, and CRAZY WORLD is not only palatable to the most staunchest of reggae fans, but incorporating a life's mix of influences, it's also digestible to the casual fan - simply looking for a well produced fresh spin on the classic vibe.